"Don't you believe in anything?" Whether or not you believe animals have immortal souls, their value in our earthly lives is immeasurable. Humanity's admiration for these creatures ranges from revering their friendship to appreciating their place on the dinner plate, with plenty of room in between. Director Robert Bresson is a man of these unnamed spaces�the kinds of inexplicable feelings and moments that cannot be conveyed through words. His is a cinema of spirituality, where silence takes on a universality that transcends language. Akin to Diary of a Country Priest, the devoutly Catholic Bresson is fascinated with themes of religion, but to simply equate this film as Biblical allegory may be a disservice. Balthazar seems to be any other donkey, but the events of his life convey the complexities of humanity. One of the first images of the fated animal is one of innocence: the young Balthazar drinks milk from his mother, and is spotted by two children. Marie (Anne Wiazemsky) and Jacques (Walter Green) are enamored by the future beast of burden, and promptly take him home. As Balthazar grows, so does Marie, whose love for the donkey grows in kind. The two share a deep and special connection, but like a child who forgets a favorite blanket, the concerns of adolescence soon take Balthazar's place. Meanwhile, Balthazar is passed from one cruel master to another. His keepers include a criminal, a grain dealer, and even a circus ringmaster. Though Marie is apart from her beloved friend, their lives follow a remarkably similar path. Marie has found her first love in the form of Gérard (François Lafarge), the leader of a local gang. The relationship is anything but healthy, but as Marie's foolhardy, heady wishes send her through the gauntlet, the powerless Balthazar, whose innocence seems intact, faces similar hardship. Balthazar is paying for the sins of humanity, elevating the donkey to a Christ-like persona. Cruelty and suffering seem paramount, but redemption is not far behind. Au hasard Balthazar cannot be categorized. Assigning grades to a film is one of the necessary evils of reviewing, and they seem even more arbitrary this time around. Even the performances, which are nearly catatonic at times, are resistant to ratings; from the doe-eyed Anne Wiazemsky to the slimy François Lafarge, they remain effective. Perhaps it is pointless to try a traditional critique; any attempt at a formal analysis may add more to the film than what Bresson intends, or it may not even scratch the surface. Frankly, I'm still soaking this in, but this conflict alone is evidence that something special is at work here. Bresson's style is so austere and transparent, yet it reveals the complexity of life, love, good and evil. His imagery is deliberate and precise, revealing the eye of an intense perfectionist. Some scenes are merely one shot, and the entire tapestry, which feels like a collection of small vignettes at times, is woven together with soothing lap dissolves. The camera frequently focuses on one body part, revealing only what Bresson deems essential; feet and hands are a favorite, and they prove surprisingly expressive. This could easily be a silent film. Bresson's sparseness extends to his soundtrack, which only indulges in a few renditions of Schubert's Piano Sonata no. 20, a piece that proves undeniably powerful when called upon. As stated by critic Donald Richie, this film almost acts as a cinematic inkblot, revealing something about each viewer that partakes in the experience. Whether or not you are affected certainly does not determine your spirituality, but the viewer's reaction remains important. Something is indicated by whatever reaction is evoked, though what this "something" is remains unclear. This is the mystery of Bresson, whose work I feel uncomfortable passing judgment on. There are moments when I feel this is a film buried in tedium, but I cannot deny its affecting nature. Perhaps this is my "something"—a personal reaction that is yet to be deciphered. Image Transfer Review: Criterion's anamorphic 1.66:1 transfer is immaculate. This is a simply luminous black-and-white image that is remarkably clean, with only a few instances of minor print damage. Grain is very fine, and detail is high. Beautiful. Audio Transfer Review: The French monaural track is clear, devoid of distracting hiss, and seldom harsh. Extras Review: We begin with a newly recorded video interview with film scholar Donald Richie (13m:39s, 16:9). This is certainly a surprise; one of the foremost experts of Japanese film, Richie's inclusion is unexpected. Regardless, his comments are very insightful, and capture my experience with the film remarkably well. While I did not cry at the end as Richie always does, I could not help but be moved. A nicely edited, revealing piece. 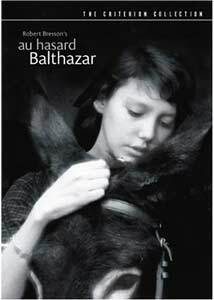 Next is Un Metteur en ordre: Robert Bresson (01h:02m:02s), a 1966 French television program about Au hasard Balthasar. It's in somewhat rough condition (especially the film clips—quite a contrast to the nearly perfect transfer), and it begins like an antiquated French version of Entertainment Tonight. This remains an intriguing show, featuring interviews with Bresson, Jean-Luc Godard, Louis Malle, Francois Riechenbach, novelist Marguerite Duras (author of the sublime Hiroshima, Mon Amour), the cinematographer, and cast members. Bresson himself reveals the meaning behind the film's title, but he seems uncomfortable doing so; he too is resistant to summarizing his work with any kind of finality. Finally, you will find an anamorphic theatrical trailer, and an insert with a rather detailed examination by film scholar James Quandt. Criterion's quality has galvinzied another Bresson fascination. This unique film defies genre, yet remains distinctly allegorical. The sufferings of human and donkey reveal the vices and virtues of humanity, conveyed through a transparent, precise visual style. Discover that "something" this film promises to release.